Contact Us Today for San Diego Shutters, Blinds, and Shades! As every business owner and employee knows, eventually, something is going to go wrong. That’s true for all areas in life, but when it comes to business, the stress can easily become amplified. After all, a successful business means a good reputation and a successful track record when it comes to providing your products and services. We recently had a client order some of our San Diego shades. Unfortunately, the manufacturer had designed them incorrectly. So, we contacted the client, made an apology, and had the shades remade at no extra charge. We also gave them a discount for their inconvenience. The client was very appreciative, so much so that they gave us a fantastic review on Yelp despite the mix-up. Mistakes happen in the workplace all the time, and it’s up to every business owner to try and mitigate these occurrences as much as possible. What helps is the understanding that negative experiences can actually be transformed quite easily into positive ones. If a customer sees you go out of your way to rectify a problem, it can actually give the same impression of a job done flawlessly. Many times, businesses only see just how dissatisfied certain customers are when reading online reviews. For many people, voicing the full extent of their frustration is difficult in person, as this puts them in a confrontational place with others. On the other hand, writing something out online allows them to voice their frustrations in private – that’s when they really speak their mind. Throughout the course of your profession, whether you’re selling blinds and shutters in San Diego or hot dogs somewhere on the East Coast, it’s important to understand how to respond to negative online reviews. Large and small businesses alike are affected by the internet, which seems to permeate virtually every aspect of our lives. Don’t take it personally. We know, this is easier said than done. However, it’s important that you approach this situation in a calm and collected mood. Take some time before you respond. This helps your emotions to settle down and gives you time to think about ways you can solve the problem. Respond to the review. Many businesses ignore bad reviews, but the thing to remember is, no response is a response in itself. It’s also a bad response. Even if there’s simply nothing you can do to solve the problem, and their mind’s been made up, people like to see that you’re taking an interest in all feedback, positive or negative. Often, a dissatisfied customer simply wants to be heard. All you need to do is communicate that you understand their frustration and would like to offer a solution. Apologize, and then offer the solution right away. It’s important to offer fast solutions to dissatisfied customers. Even if you feel this situation wasn’t your fault, it’s good to apologize anyway. Immediately after you’ve acknowledged their complaint, suggest what you believe to be the most appropriate solution. If the reply was written out correctly and the customer responds, he or she will likely be happy at your offer to solve the problem. Not only that, they’ll probably even be a bit apologetic themselves. Most people don’t expect businesses to acknowledge reviews at all. They see the review section as simply a place to vent. When they see their review has actually been read and is being taken seriously by the business, their frustration is likely to diminish. 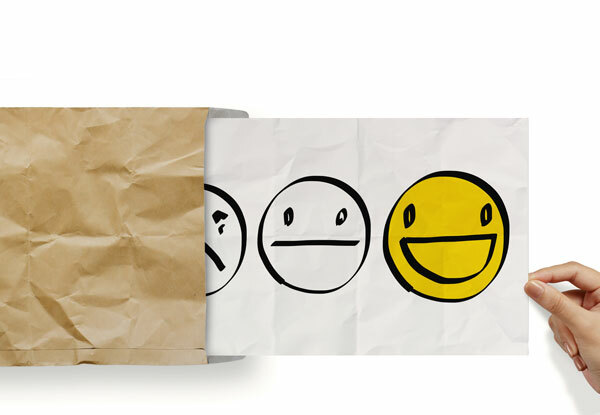 Positively responding to negative reviews has a good track record for converting unhappy customers to future customers. However, even if they don’t reply, and your offer is left hanging, this has still accomplished something important: It has shown those who read your business reviews that you care about what your customers think, and that you’re willing to go above and beyond to solve any problems. 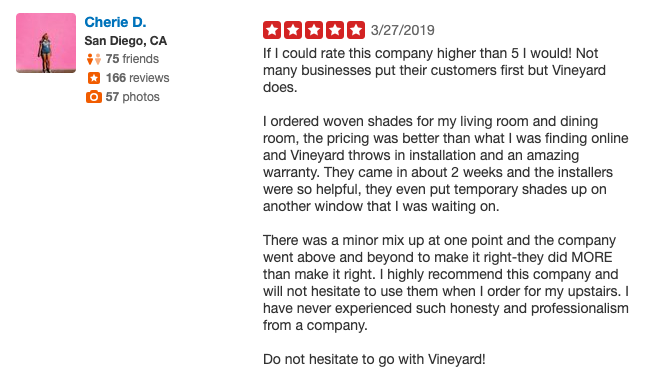 As a company that prides itself on its quality San Diego shutters, blinds, and shades, we try our best to give our customers exactly what they want. When mix-ups happen, it’s important for all businesses to do what it takes to make their customers happy.